The Sky Wagon droned through Caribbean skies, following a compass course that led to Charlotte Amalie, capital city of the Virgin Islands. With eager interest, the four people in the small plane watched the blue water below. In a few moments they should pass over the island that was their ultimate destination. 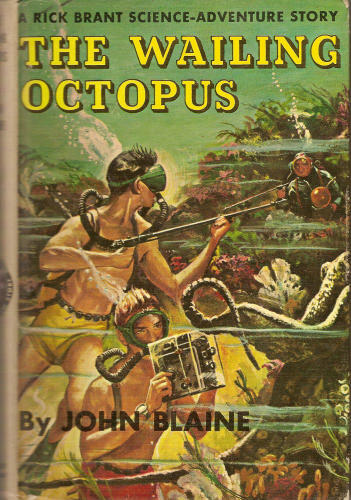 A non-fiction companion volume to the collectible Rick Brant Science-Adventure Series. This reprint includes easy-to-read chapters about codes and ciphers, slingshots and archery, microscopes and radios, tricks and games, and scientific experiments. This adventure story is a great read for anyone who loves vintage pulp fiction from the 1950s. Rick Brant is a boy who lives on an island called Spindrift and takes part in so many thrilling adventures and baffling mysteries involving science. Rock, melting like butter on a hot stove! Jam-packed with excitement and swift, tense action, The Flaming Mountain has all the elements that have made the Rick Brant Science Adventure series a favorite with boys all over the world. It was hot in the cabin of the freighter Asiatic Dream. The heaviness of the tropical heat penetrated through the steel and flaking paint of the deck to turn the cabin into an oven. Rick Brant and Don Scott were oblivious of the heat.